The information presented on this page was originally released on May 2, 2016. It may not be outdated, but please search our site for more current information. If you plan to quote or reference this information in a publication, please check with the Extension specialist or author before proceeding. While this may seem to be a trick question requiring a lot of consideration, the answer is really very simple: My ultimate, go-to, warm-weather flowering annual is the marigold. I know you may be thinking, “With so many great plants out there in the garden centers, you choose marigolds?? ?” So today I present my case for growing marigolds, which may be the most underappreciated flowering annual ever. We can plant and enjoy marigolds anytime from spring to fall. In fact, when used as a fall mum alternative, they’re even called Mari-mums. Marigolds are great in flowerbeds or in containers, and they add a cheerful and colorful brightness wherever they are planted. And while it’s easy to buy transplants for your garden, gardeners on a budget can easily grow marigolds from seed from May through the fall. Sprinkling a few seeds around the garden now will reward you with fresh new flowers later this summer. 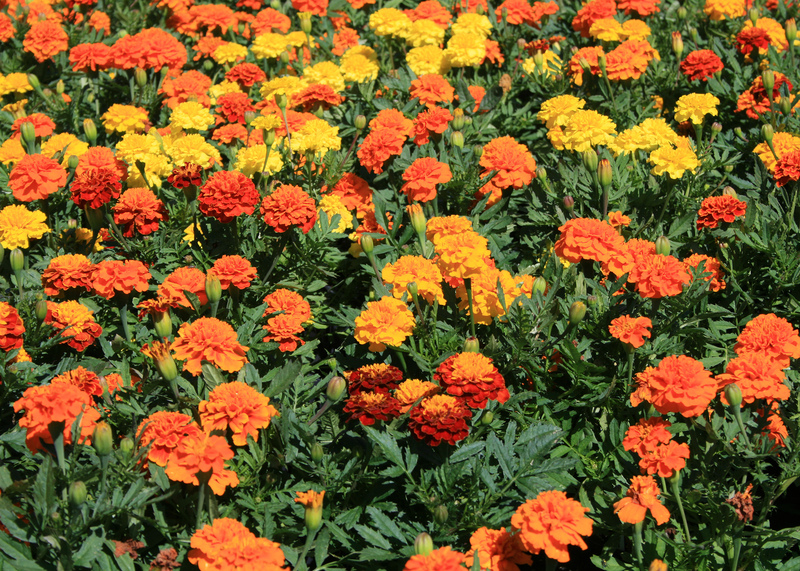 The diverse marigold family, called Tagetes, includes more than 50 different species. Even Mexican tarragon, which is not in the tarragon family, is actually a marigold called Mexican Mint. All have leaves that are compound in structure, and all have fragrant flowers, though some gardeners find the fragrance not at all pleasant. The two most widely available varieties are the American and the French marigold. 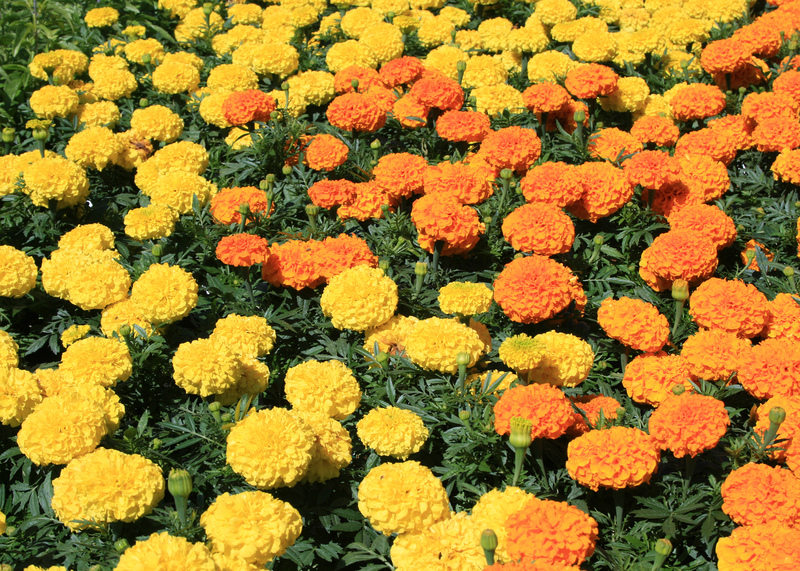 Regardless of the name, all marigolds come from Mexico and Central America. The American marigold is also commonly called the African marigold, known scientifically as Tagetes erecta. There are many series available, ranging from 15 inches to more than 3 feet tall. A flowering annual series is a group with similar plant and flower sizes and with many different flower colors. American marigolds are recognizable for their pom-pom double flowers. Popular series include the First Lady, Discovery, and Antigua, which is my favorite. These series feature colors of yellow, white, orange and dark orange. With their big flowers and taller stems, American marigolds sometimes need staking. French marigolds, known scientifically as Tagetes patula, are smaller and have more flower variety. They come in single and double flowers that are yellow, orange, red or striped. Popular series include Janie and Sophia. French marigolds are generally less than 15 inches tall. Marigolds are free flowering from early summer to frost, but you will have to deadhead and remove the faded flowers to keep them in full bloom. There are a couple of marigold garden myths I want to address. The first is that they repel insects. In fact, spider mites are attracted to marigolds and can make infestations worse. A second myth is that marigolds and tomatoes are good companion plants. This belief may have some truth, as there is anecdotal evidence that marigolds do help around tomatoes. To many gardeners, marigolds are ignored because they’re just those common yellow flowers. They’re taken for granted, all right, because they’re easy and don’t require much care. So consider that a selling point. As long as you plant them in full sun and water consistently, marigolds may just become your go-to summer-flowering annual.